Malians express great pride in their ancestry. Mali is the cultural heir to the succession of ancient African empires – Ghana, Malinké, and Songhai – that occupied the West African savannah. These empires controlled Saharan trade and were in touch with Mediterranean and Middle Eastern centers of civilization. The Ghana Empire, dominated by the Soninke or Saracolé people and centered in the area along the Malian-Mauritanian frontier, was a powerful trading state from about A.D. 700 to 1075. 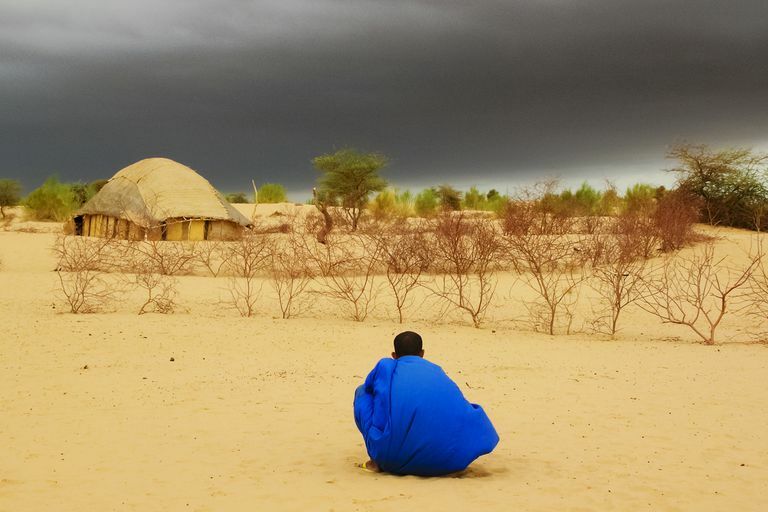 The Malinké Kingdom of Mali had its origins on the upper Niger River in the 11th century. Expanding rapidly in the 13th century under the leadership of Soundiata Keita, it reached its height about 1325, when it conquered Timbuktu and Gao. Thereafter, the kingdom began to decline, and by the 15th century, it controlled only a small fraction of its former domain. French military penetration of the Soudan (the French name for the area) began around 1880. Ten years later, the French made a concerted effort to occupy the interior. The timing and resident military governors determined methods of their advances. A French civilian governor of Soudan was appointed in 1893, but resistance to French control did not end until 1898 when the Malinké warrior Samory Touré was defeated after 7 years of war. The French attempted to rule indirectly, but in many areas, they disregarded traditional authorities and governed through appointed chiefs. As the colony of French Soudan, Mali was administered with other French colonial territories as the Federation of French West Africa. In 1956, with the passing of France's Fundamental Law (Loi Cadre), the Territorial Assembly obtained extensive powers over internal affairs and was permitted to form a cabinet with executive authority over matters within the Assembly's competence. After the 1958 French constitutional referendum, the Republique Soudanaise became a member of the French Community and enjoyed complete internal autonomy. In January 1959, Soudan joined Senegal to form the Mali Federation, which became fully independent within the French Community on 20 June 1960. The federation collapsed on 20 August 1960, when Senegal seceded. On 22 September Soudan proclaimed itself the Republic of Mali and withdrew from the French Community. President Modibo Keita – whose party Union Soudanaise-Rassemblement Démocratique Africain (US-RDA, Sudanese Union-African Democratic Rally) had dominated pre-independence politics – moved quickly to declare a single-party state and to pursue a socialist policy based on extensive nationalization. A continuously deteriorating economy led to a decision to rejoin the Franc Zone in 1967 and modify some of the economic excesses. On 19 November 1968, a group of young officers staged a bloodless coup and set up a 14-member Military Committee for National Liberation (CMLN), with Lt. Moussa Traoré as Chairman. The military leaders attempted to pursue economic reforms but for several years faced debilitating internal political struggles and the disastrous Sahelian drought. A new constitution, approved in 1974, created a one-party state and was designed to move Mali toward civilian rule. However, the military leaders remained in power. In September 1976, a new political party was established, the Union Démocratique du Peuple Malien (UDPM, Democratic Union of the Malian People) based on the concept of democratic centralism. Single-party presidential and legislative elections were held in June 1979, and General Moussa Traoré received 99% of the votes. His efforts at consolidating the single-party government were challenged in 1980 by student-led, anti-government demonstrations, which were brutally put down, and by three coup attempts. The political situation stabilized during 1981 and 1982 and remained generally calm throughout the 1980s. Shifting its attention to Mali's economic difficulties, the government worked out a new agreement with the International Monetary Fund (IMF). However, by 1990, there was growing dissatisfaction with the demands for austerity imposed by the IMF's economic reform programs and the perception that the President and his close associates were not themselves adhering to those demands. As demands for multiparty democracy increased the Traoré government allowed some opening of the system (the establishment of an independent press and independent political associations) but insisted that Mali was not ready for democracy. In early 1991, student-led, anti-government rioting broke out again, but this time government workers and others supported it. On 26 March 1991, after 4 days of intense anti-government rioting, a group of 17 military officers arrested President Moussa Traoré and suspended the constitution. Amadou Toumani Touré took power as the Chairman for the Transitional Committee for the Salvation of the People. A draft constitution was approved in a referendum on 12 January 1992 and political parties were allowed to form. On 8 June 1992, Alpha Oumar Konaré, the candidate of the Alliance pour la Démocratie en Mali (ADEMA, Alliance for Democracy in Mali), was inaugurated as the President of Mali's Third Republic. In 1997, attempts to renew national institutions through democratic elections ran into administrative difficulties, resulting in a court-ordered annulment of the legislative elections held in April 1997. It demonstrated, however, the overwhelming strength of President Konaré's ADEMA Party, causing some other historic parties to boycott subsequent elections. President Konaré won the presidential election against scant opposition on 11 May. General elections were organized in June and July 2002. President Konare did not seek reelection since he was serving his second and last term as required by the constitution. Retired General Amadou Toumani Touré, former head of state during Mali's transition (1991-1992) became the country's second democratically elected President as an independent candidate in 2002 and was reelected to a second 5-year term in 2007. Public Domain, US Department of State Background Notes.